Ferris Bueller would live-tweet his adventures with Cameron and Sloane, while Sam Baker would spend time Pinning her way to a dream birthday party. It’s been 30 years since 1985, but our favorite Brat Pack movies are as popular as ever. These films helped define a generation and remain relatable today, even in this age of hyper connectivity, technology and interaction. Leading up to October 21, 2015, better known as the day Marty McFly travels to the future, we’ll be exploring some of the most beloved ‘80s flicks under the lens of social media. On the surface, Ferris Bueller and Sam Baker, the central characters of the iconic John Hughes films Ferris Buellers’ Day Off and Sixteen Candles, are polar opposites. Insecure and overly sensitive, Sam is devastated when her family forgets her birthday. Sam feels invisible as she treads through her sister’s wedding preparation and the trials and tribulations of being a high school underclassman and facing the big school dance. On the flip side, high school senior Ferris experiences a surge in popularity after faking an illness to skip school, successfully tricking his parents and dean of students, among others. Ferris finds “Save Ferris” posters plastered about town, from water towers to newspapers, in sympathy for his “illness,” all while he and his friends are touring the city of Chicago. Despite these characters’ contrasting personalities, both characters have long-resonated with teenagers yearning to challenge authority and find their own place in the world. However, were these films set in 2015, the rise of social media would drastically alter both Sam’s and Ferris’ interpersonal communication, broadcasting their larger-than-life experiences to a broader audience and changing the way others relate to their escapades. According to Mr. Rooney, dean of students, a student like Ferris is dangerous because he gives good kids bad ideas. “The last thing I need at this point in my career is 1,500 Ferris Bueller disciples running around these halls,” he gripes. Social media could do just that, in minutes, converting bored students into informed advocates. With an ego as big as his, could we expect Ferris not to livestream his adventure? Bits of his voyage would likely be streaming across Meerkat and Periscope. His friends would watch, in real-time, as he crashes the Van Steuben Day Parade and witness his epic “Twist and Shout” performance for themselves, without relying on hearsay. In the age of social media, friends of Ferris no longer have to hear his trials and tribulations from their “best friend’s sister’s boyfriend’s brother’s girlfriend” — Ferris would also likely live-tweet the experience, ensuring his followers know his exact thoughts. Aside from detailing his ventures, Ferris would share #DayOff tips for those looking to plot their own escape, advising students how to stage convincing symptoms. 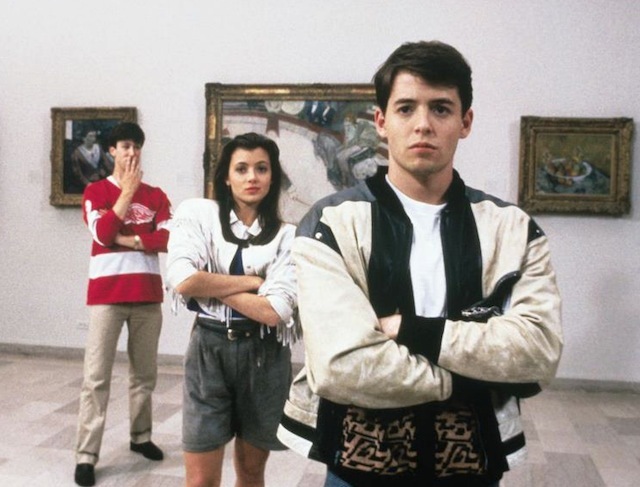 Ferris’ admirers could recreate his adventures by following his check-ins at the Sears Tower, Wrigley Field, the Art Institute of Chicago and Chez Quis. Unfortunately, depending on how closely Mr. Rooney and Ferris’ parents were following his social activity, they may be able to bring his rendezvous to a halt. While social media would certainly aid in Ferris’ popularity, his antics would also be heightened by app technology. Novelty apps could be used in place of pianos and recording devices to play coughing and sneezing side effects and Ferris may even develop a program to disguise his voice, easing Cameron’s guilty conscience. In fact, with a quick mind like this, we wouldn’t be surprised to find him participating at a local hackathon. While Ferris Bueller is revered, poor Sam Baker is often disregarded. To ensure her special birthday is not forgotten, she’d share nostalgic #ThrowbackThursday collages from previous celebrations on Instagram. Paranoid, as her sister creates her dream wedding Pinterest board, Sam may start her own birthday-themed board with party ideas – birthday cakes, cocktail dresses and present wish lists to really drive the point home. However, even if she didn’t do these things, trusty Facebook would remind everyone on the morning of to wish Sam a happy day.